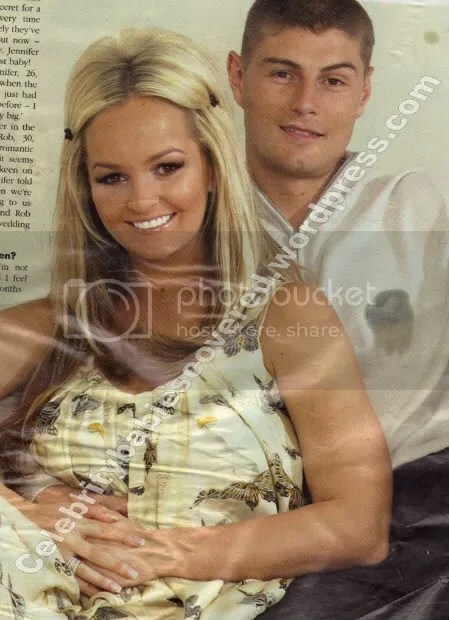 Jennifer Ellison and Fiance Rob Tickle Announce Their Pregnancy News In OK! 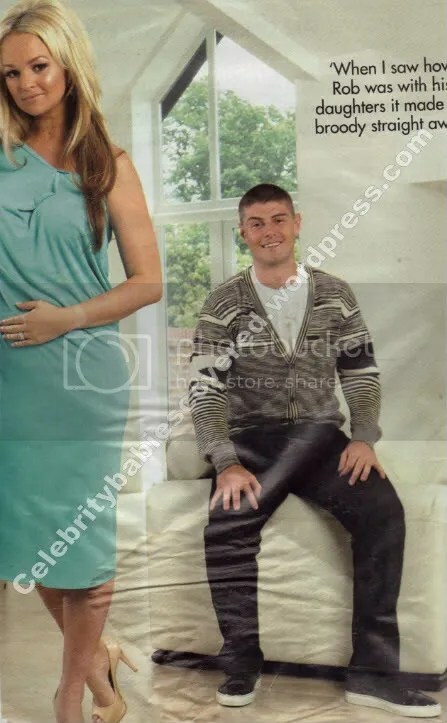 Actress Jennifer Ellison and her fiance Rob Tickle have been hiding a very big secret for a couple of months but they now feel ready to reveal all — Jennifer is 4 months pregnant with the couple’s first child. Together they talk exclusively to OK! magazine about the pregnancy, their wedding plans and why Jennifer is now feeling healthier than ever. J: I feel healthier than ever because I’m not drinking. I’m getting to bed early and I feel absolutely fantastic. In the first few months I was touring and performing on War Of The Worlds every night so I thought I’d struggle, but I’ve loved every minute. J: We started trying in September thinking it would take a while, but it happened the first month so we’re extremely lucky. Rob: I’m over the moon! J: Only for cola really. R: I’ve been dying to run around after her but it still hasn’t happened. J: We want it to be a surprise. R: I’d like a little boy because I’ve already got two daughters but I’m not too fussed either way because I’ll keep having more kids as long as Jen wants them! I love being a dad. J: I found a kid’s football shirt saying ‘No 1 Tickle’ on the back so we had to get it — just in case it is a boy. R: It’s not daunting anyway, but I’m in a better position now with it being just one. With the twins, I’d see them half the week and they’d have the other half with their mum. But this time I’ll be able to give the baby a kiss before work and put the baby to bed, and do a lot of the things I missed out on with the girls. J: Amazing. When I saw how Rob was with his daughters, I was broody straight away. It’s a relief because he knows exactly what to do and he’s so good with babies. He’ll be changing nappies, the lot! J: People say that when your baby comes your life changes, but mine already has. All my priorities have changed. It won’t change our relationship because we couldn’t get any closer. It will just take us to the next level. We just clicked and stuck together ever since our first date. R: She’s my best mate and I never thought I’d find that in a relationship. It sounds corny but we’re inseperable. J: No. I’ve actually lost it! Before I was pregnant I was just under ten stone and I’m still just under that. With not drinking and eating healthily it’s come off my legs and bum. J: No! I want to be spending time with my baby not hammering the gym! J: I did at first but not now. It was a real eye-opener seeing everyone at Gary Cockrill and Phill Turner‘s wedding — they had such sore heads after! I’ll never go back to drinking the way I used to. I enjoy being sober. With drinking a lot of the time you try and find happiness, but I’ve realised you don’t have to. Now I’ve had fantastic nights out without drinking and felt great the next day. At my baby shower my mates will be drinking copious amounts of wine and I’ll be on softs! R: I’ve cut it out too. J: I’d love a natural water birth with no pain relief. And Rob wants to be really hands-on and see his baby being born — I want him to too. R: I do because it’s the most magical thing that can happen in your life and I want to make sure it all goes right. Jen was born to Spandau Ballet‘s True so maybe we’ll have playing in the background during the birth! J: No — she doesn’t know I’m pregnant. I think everyone just thinks I’m just getting a tummy. Rob and I have been like two Cheshire cats and nobody knew why! J: I’d love to get married next year but it just depends how much time the baby takes up. R: We want to wait until the baby is a bit older so they can be a part of it too. J: I don’t want our wedding to be over the top. We’ve talked about it and we just want it full of the important people in our lives — I just can’t wait to be Mrs Tickle! This entry was posted in Cover Stars, Expecting, Interviews, Magazine Shoots, Pregnancy Photos and tagged Jennifer Ellison, Rob Tickle. Bookmark the permalink. ← Gareth Gates and Suzanne Mole Introduce Daughter Missy in OK! I am a great fan of Jennifer Ellison . the news of her pregnancy really surprised me and i want to give my wish to that child.And take care.